Contrast thresholds for 75% correct depth identification in narrow-band filtered random dot stereograms were determined for different center spatial frequencies and binocular disparities. Rigorous control over vergence was maintained during testing, and a forced-choice procedure was used. The resulting contrast sensitivity function for stereopsis revealed sensitivity over a greater range of disparities at low than at high spatial frequencies. Sensitivity peaked for large disparities at low spatial frequencies and for small disparities at high spatial frequencies. When disparities were converted to effective binocular phase differences, the variation of contrast sensitivity with phase followed a consistent pattern across spatial frequencies, with peak sensitivity occurring mainly for binocular phases of between 90° and 180°. These results have implications for the extent of spatial integration at the input to the disparity sensing mechanism. A model postulating a spread of positional disparities independent of the spatial frequency selectivity of disparity-sensitive units cannot account for the results. But the size–disparity correlation strongly evident in our data is predicted by certain models of stereopsis, such as phase disparity encoding. 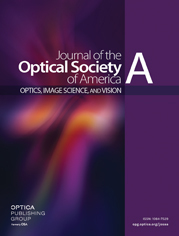 An ideal observer analysis is developed that demonstrates that our results were not forced by the nature of the stimulus employed; rather, the quantum efficiency for stereopsis at contrast threshold follows the size–disparity correlation.